Journal of Nanjing Agricultural University, 2019, 42(2): 365-372. 何灿隆, 沈明霞, 刘龙申, 等. 基于加速度传感器的肉鸡步态检测方法研究与实现[J]. 南京农业大学学报, 2019, 42(2): 365-372. 通信作者：沈明霞, 教授, 博导, 主要从事机器视觉与信息农业研究, E-mail:mingxia@njau.edu.cn. Abstract: [Objectives] The current modes of broiler lameness detection system mainly rely on breeders, and hence are always faced with the problem of subjectivity and unreliability. This study proposes a gait detection system based on three-axis acceleration sensor. [Methods] A wireless foot-loop based on three-axis acceleration sensor was developed. The effective data points for broiler walk was determined by a walking self-detection(WSD) algorithm. 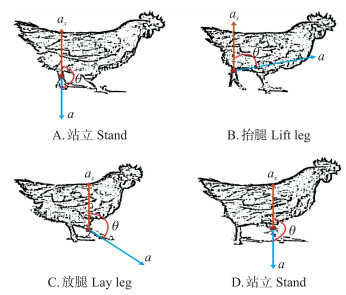 Logistic Regression algorithm was used to establish a two-class model for health-lameness in broilers, and finally, the degree of lameness was measured by Euclidean distance. [Results] The test results showed that the wireless foot-loop could quickly collect and transmit the broiler leg movement information. The average accuracy rate of broiler health-lameness two-class model was 93.88%. The Euclidean distance approximated the extent of lameness. [Conclusions] An automatic detection algorithm for broiler gait was proposed to provide a new method for broiler gait detection underfloor system. 图 6 肉鸡行走试验特征Δamax分布图 Fig. 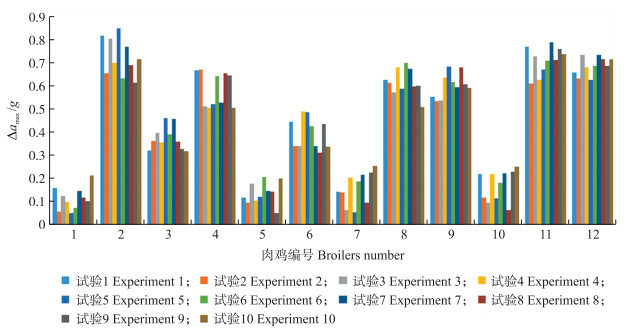 6 Distribution of feature Δamax in broiler walking test 肉鸡编号:1, 5, 7, 10代表健康肉鸡; 2, 3, 4, 6, 8, 9, 11, 12代表跛行肉鸡。下同。 Broiler number:1, 5, 7, 10 represent healthy broilers; 2, 3, 4, 6, 8, 9, 11, 12 represent lameness broilers. The same as follows. 张瑞娟. 中国肉鸡产业发展现状及趋势[J]. 江苏农业科学, 2016, 44(1): 448-451. Zhang R J. The status and trend of China broiler industry development[J]. Jiangsu Agricultural Sciences, 2016, 44(1): 448-451 (in Chinese). 李鹏飞, 姜敏, 史超颖, 等. 规模化养殖场肉鸡腿病情况调查[J]. 畜牧与兽医, 2016, 48(6): 116-118. Li P F, Jiang M, Shi C Y, et al. An investigation of broiler leg disorders in large-scale farms[J]. Animal Husbandry & Veterinary Medicine, 2016, 48(6): 116-118 (in Chinese). 沈良诚, Morris M P. 美国对肉鸡腿疾的全国性调查情况[J]. 国外畜牧学:猪与禽, 1993, 13(6): 42-45. Shen L C, Morris M P. National survey of broiler leg diseases in the United States[J]. Animal Science Abroad:Pigs & Poultry, 1993, 13(6): 42-45 (in Chinese). 史红梅. 肉鸡腿病发生的原因及防制措施[J]. 农业技术与装备, 2017(6): 93-94. 沈明霞, 刘龙申, 闫丽, 等. 畜禽养殖个体信息监测技术研究进展[J]. 农业机械学报, 2014, 45(10): 245-251. Alsaaod M, Römer C, Kleinmanns J, et al. Electronic detection of lameness in dairy cows through measuring pedometric activity and lying behavior[J]. Applied Animal Behaviour Science, 2012, 142(3/4): 134-141. 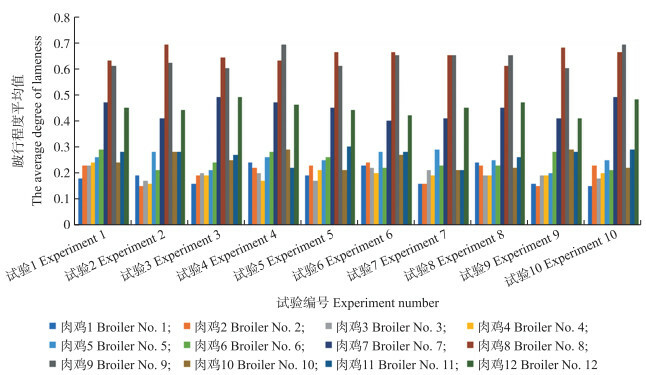 Jiang Y B.Effects of welfare rearing techniques on the performance and welfare of broilers[D].Tai'an: Shandong Agricultural University, 2010(in Chinese with English abstract). 刘龙申, 沈明霞, 姚文, 等. 基于加速度传感器的母猪产前行为特征采集与分析[J]. 农业机械学报, 2013, 44(3): 192-196. Liu L S, Shen M X, Yao W, et al. 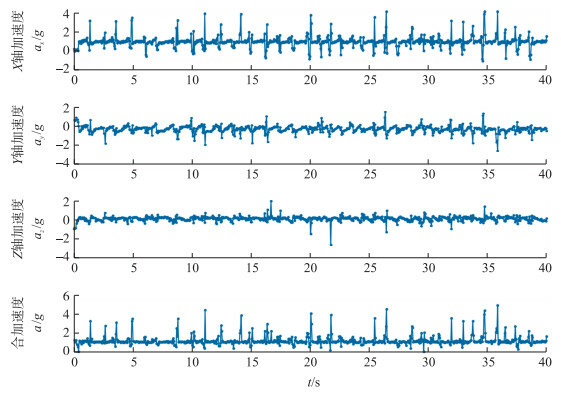 Acquisition and analysis of sows'behavior before farrowing based on acceleration sensor[J]. Transactions of the Chinese Society for Agricultural Machinery, 2013, 44(3): 192-196 (in Chinese with English abstract). 张俊杰, 孙光民, 李煜, 等. 基于加速度传感器的上肢运动信息采集与姿态识别[J]. 北京工业大学学报, 2017, 43(7): 978-986. Zhang J J, Sun G M, Li Y, et al. Upper limb motion information acquisition and gesture recognition based on acceleration sensor[J]. Journal of Beijing University of Technology, 2017, 43(7): 978-986 (in Chinese with English abstract). 赵阳, 娄小平, 刘锋, 等. 自适应MEMS加速度计滤波算法[J]. 传感器与微系统, 2016, 35(11): 120-122. Zhao Y, Lou X P, Liu F, et al. Adaptive filtering algorithm of MEMS accelerometer[J]. Transducer and Microsystem Technologies, 2016, 35(11): 120-122 (in Chinese with English abstract). 邢秀玉, 刘鸿宇, 黄武. 基于加速度传感器的步态分类研究[J]. 传感器世界, 2013, 19(4): 10-13. Menard S. Applied logistic regression analysis[J]. Technometrics, 1996, 38(2): 192.